Rite Aid Weekly Ad 06/07 - 06/13/2015. BOGO Sale! Rite Aid Weekly Ad 06/07 – 06/13/2015. BOGO Sale! 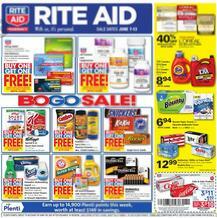 Latest best Rite Aid deals valid June 7 – 13, 2105: B1G1 Free Rite Aid Allergy Relief; B1G1 free Rite Aid Vitamins and Supplements; B1G1 free Single Serve Candy; B1G1 free Scott Bathroom Tissue; $8.94 Tide Laundry Detergent; B1G1 Free Nature’s Truth Vitamins and Supplemetns; B1G1 free Schiff MegaRed, Move Free and Schiff Glucosamine; $9.99 Excederin; $10.99 Airborne Dual Action; $9.99 All Boston Eye Care Products, Bausch & Lomb Soothe Hydration Drops and PM Ointment or Always Eye Itch; $16.99 Huggies Snug and Dry Diapers; $19.99 MicroTouch 3 Tough Blade; $5.99 Garnier Fructis Shampoo or Conditioner; B1G1 free Folding Armless Quad Chair; 25% off Libman Cleaning Supplies; $10 off All Rite Aid Blood Presure Monitors; 50% off Spring/Summer Value Toys, Squirt Guns, Pool Toys and Inflatables; and more.